I’ve done a series in this blog where I’ve chronicled tiny little bits of Cambridge – doorknockers and address plates and signage – and I’ve neglected the biggest things in Cambridge – the colleges, and the churches. Cambridge University is composed of 33 colleges, each of which have their own walled campus with residences, dining halls, libraries, common rooms, and bars (open to college students, alumni, and their guests). The colleges are the defining urban design determinant in the city; most of them (especially the old ones, in the city center) are walled, which gives the city a strange character. Its especially amazing because, as you walk around the city, you don’t realize how vast and opulent and beautiful all these places are – and then you step inside and its a whole different world. And its not like Cambridge is a crime-ridden ghetto. The colleges are oases within an oasis, which is really saying something. There are no bikes or cars in the colleges; the only detractor is the slouchy teenagers that get to live in all these places. 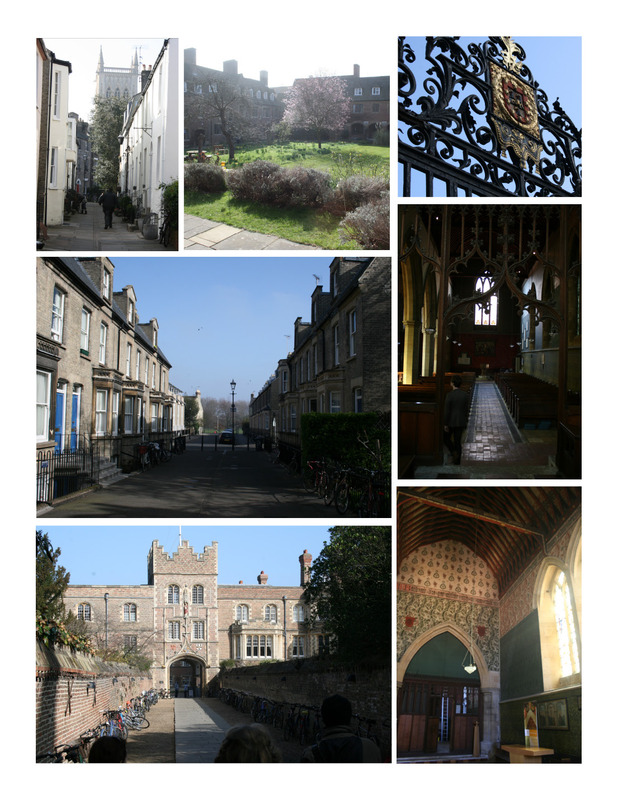 The collage has photos of Jesus College, the Cambridge Seminary (unaffiliated with the university – I didn’t even know it was there until we were inside), and an arts and crafts church that doesn’t look like much from the outside. I’ve been saving my College Photo collection for rainy days, and seeing as it is supposed to rain tomorrow, it seemed like a good time. On Friday, I’ll be posting my experience watching the Romseytown RollerBillies, Cambridge’s roller derby team. And this weekend I’m headed to Cornwall (again) to check out Falmouth and go walking and see some seabirds and, if I’m lucky, to go to the Eden Project, a famous botanical garden. And also try not to kill myself and others driving a rental car. Wish me luck!